After spending nearly two years behind bars, Plaxico Burress has been released from jail and will be looking to rebuild both his life off the field and his career on it. 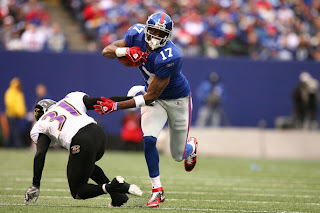 The talented but often troubled receiver has certainly experienced his share of trials and tribulations during his career, and no one has been through more with Burress than Giants fans. The marriage between the two started in the offseason of 2005 when a usually frugal Giants front office opened up their checkbook to bring Burress to New York after he spent five seasons with the Pittsburgh Steelers. The numbers Burress posted in Pittsburgh were definitely above average, especially his back-to-back 1,000 yard efforts in his second and third seasons in the NFL, but the Giants realized that his value extended far beyond statistics. Standing 6'5'' and possessing an impressive blend of speed and power for such a large receiver, his size was a security blanket for quarterbacks and a supreme mismatch for any defense to try and contain. Because of this, it's not surprising that the Giants jumped at the chance to pair Burress with Eli Manning, who was entering just his second season as a starting quarterback in the NFL. In a lot of ways, bringing Burress to the Giants was as much an investment in the lanky receiver as it was in Manning who was young and still learning how to adapt to life in the NFL. In his first season with Manning and the Giants, Burress hit the ground running and the 1,214 yards and seven touchdowns he posted certainly vindicated his signing the season before. As the combination of Manning to Burress continued to mature, so did an up and coming Giants team which managed to reach the playoffs in every season the two played together. Of course, this success ultimately culminated in the Giants beating the Patriots in Super Bowl XLII and with Manning throwing the game winning touchdown to Burress. That fade to the back of the endzone from 13 yards out is a play which is as cherished and revered as any in the proud history of the New York Giants franchise. It is also, without a doubt, Burress' defining moment with the team and what any player who plays the game at its highest level can hope to achieve. At the same time, the Giants relationship with Plaxico Burress was far from perfect and there were plenty of bumps in the road before and after his Super Bowl heroics. Burress has had his name in the news for his actions off the field on multiple occasions, and whether it's the domestic disturbances which occurred at his house in 2008, a bevy of somewhat bizarre civil lawsuits, or the star receiver threatening to hold out of mini-camp just months after his storied touchdown catch, Plaxico made a habit of keeping the Giants organization and it's fan base on their toes. When the towering receiver was at his best, he was nearly an unstoppable force in the passing game and when he was at his worst, his behavior would become destructive and his presence on the football field was generally of little help to the Giants. Obviously, his most recent and most egregious mistake of bringing an unlicensed handgun to a Manhattan night club and subsequently shooting himself in the leg landed him in jail and had a profoundly negative impact on both Burress and the Giants. In Plaxico's case, it doesn't get much more negative than the public embarrassment of shooting yourself in the leg with your own illegal handgun and then going to prison for it, a punishment which not only derailed his football career when he was in his prime, but one that also caused him to miss the birth of his daughter. As for the Giants, they were fresh off their improbable Super Bowl victory and sitting with an impressive 10-1 record before that fateful late-November night. 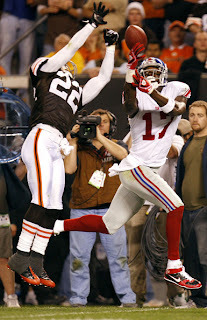 Before the Burress nightclub incident, the Giants were a serious contender to challenge for another Super Bowl title but after the media circus which surrounded Plaxico's self inflicted wound which subsequently left the Giants without their best receiver, the team would go just 2-4 in their last six games. The Giants final loss coming at the hands of the Philadelphia Eagles in the Divisional Round of the playoffs where Eli and the passing game struggled mightily. It's certainly not fair to blame Burress for the Giants sudden collapse after such a promising start to the 2008 season, but it's also hard to argue that his now infamous night at the Latin Quarter was a major turning point in the season for that Giants team. For Giants fans everywhere, it's hard not to have bittersweet feelings about the receiver who was such a big part of Eli Manning's development as well as the team's third Super Bowl title, but Burress was also the architect of his own stunning fall from grace. He battled through injuries, was by all accounts a good teammate, gave the Giants some of the best years of his football career, and helped them win a Super Bowl. He also made mistakes, didn't always do the right things off the field, and brought embarrassment to the Giants organization. 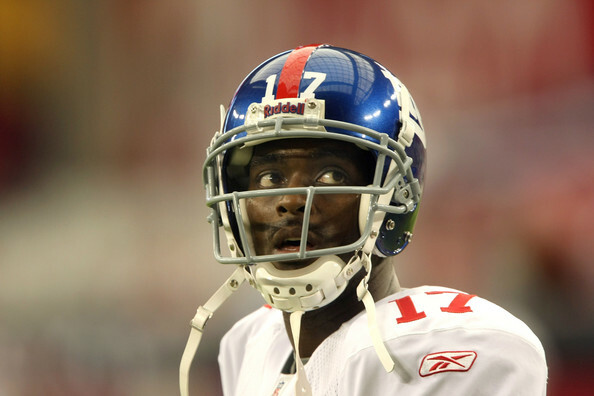 It's hard to find a more bittersweet player from a fan's perspective than Plaxico Burress was to the Giants, and now he's out of jail and looking to revive his football career. It will almost certainly not happen in New York as the Giants have already been burned by Burress once, who has also stated that he wants a "new start". But there's little doubt that there will be a team interested in a 6'5'' receiver who has racked up nearly 8,000 receiving yards and 55 touchdowns over his career. Wherever it happens, it's going to be a tough sight for Giants fans to watch, because while most of them will probably be happy that he is moving on with his life and getting back to the game he loves, many fans will be stuck wondering what could have been if Burress had simply stayed out of trouble. Much of his future in the NFL is uncertain and it remains to be seen how how much the soon-to-be 34 year old will have left in the tank after being away from football for nearly two years. But what remains certain is that, whatever happens, Burress and Giants fans will continue their bittersweet relationship as both parties try to move on after another chapter in this strange story has come to an end and another one is about to begin.